Ask any Cebuano for local food suggestions and they’d tell you to try Cebu’s lechon. 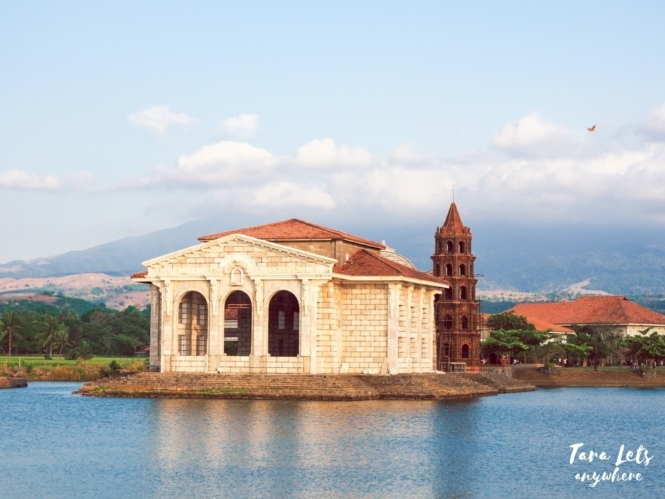 Lechon or roasted pig is of course a Filipino specialty, but Cebu takes pride on their lechon because of its quality and extra flavor. 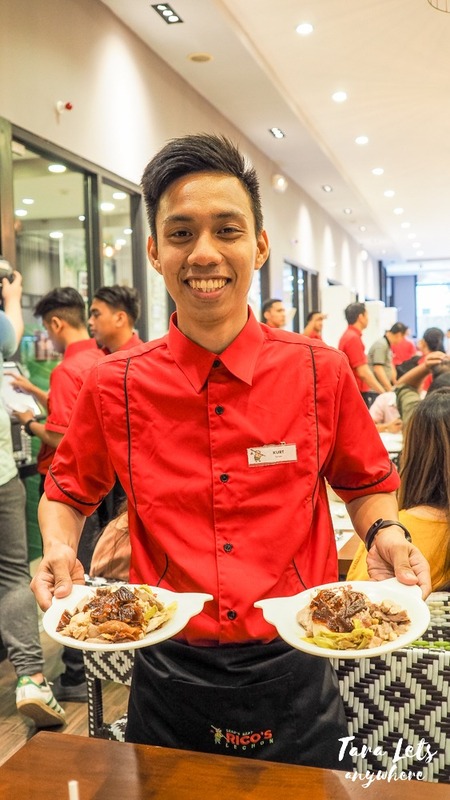 The good news is that you no longer have to fly to Cebu to taste their lechon, as Rico’s Lechon restaurant expands their business to Manila. In fact, this October 2018, it has opened its latest and biggest branch in Tiendesitas, Pasig. We got an invite to be part of its pre-opening launch and I got to see what all the excitement is about! So to give you a bit of background about Rico’s Lechon restaurant, it’s a local favorite in Cebu and is touted to serve Cebu’s best-tasting lechon (hence their slogan, “Da Best Gyud!“). Their lechon is different than usual ones in the country because they add various spices and seasonings to the meat. We’d been to Cebu before but we weren’t able to visit this restaurant, and so I was looking forward to try out their version of lechon. Rico’s Lechon branch in Tiendesitas soft opens in October 26, 2018. This branch has 300 seating capacity, with an additional VIP rooms for private functions. 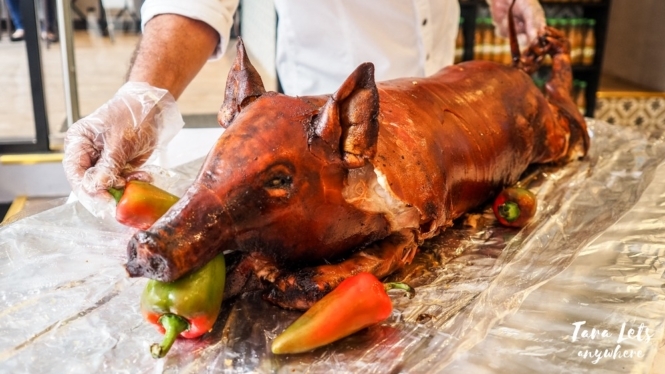 It also has a huge roasting pit that can keep up to 20 full-sized pigs and a large chopping area where you can see first-hand the staff chopping and preparing the lechon before being served. Moreover, the Tiendesitas branch has exclusive items on their menu which you can’t find in other branches. The restaurant’s interior is nice — there’s lots of tables and enough space to move around, sufficient lighting and generally modern decor. Anyway, let’s move on to the food. We ordered their lechon, obviously — the regular and spicy variants. 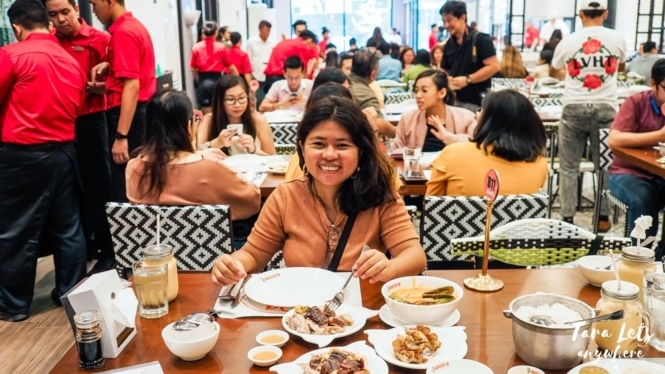 We also asked our server for recommendations and got: chicharon bulaklak for appetizer, prichon (pritong lechon), seafood kare-kare, dinuguan (pork blood stew) and sizzling tanigue. For dessert, we had pandan tapioca, kamote balls and leche flan. Let’s start with the appetizer. 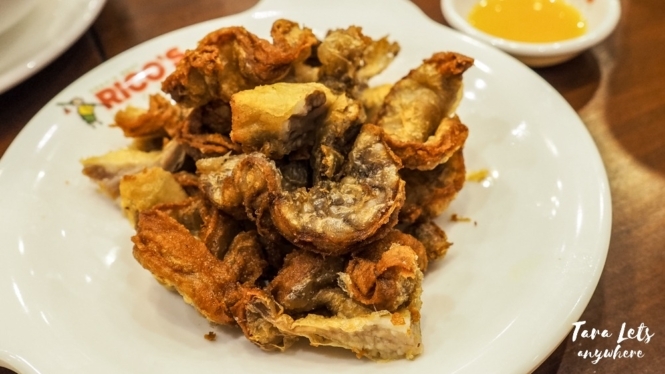 The chicharon bulaklak tasted good dipped in vinegar. It’s a must try and our server specifically recommended it to us. Off to the main dishes. Their lechon is indeed a star on its own rights. The skin is crispy, the meat delicious and tender. I like the spicy lechon over the regular one. I was not a lechon person, but after having a taste of it, I found myself craving for more lechon in the next few days. I guess it’s safe to say I’d been successfully converted to be one of the millions of Filipinos who love a good roast. The spiciness is able to bring out flavors and it goes perfectly well with plain rice. No sarsa needed. Oh, and another good thing about their lechon is you’re guaranteed you’re getting freshly roasted pig — hence the effort to show the guests their roasting pit and chopping area. You can get their lechon in 1/4, 1/2 or 1kg per serving. A plate of 1/4kg is good for sharing for 2 people already. Meanwhile, their dinuguan and prichon are both decent. Prichon is a good choice if you want something crunchier and saltier than the lechon, but not if you’re avoiding oily food. 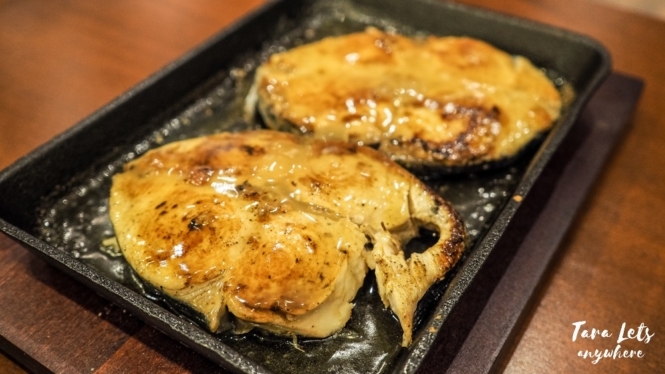 The sizzling tanigue tastes so fresh that it’s worth waiting for the extra 15-20 minutes for it. Our server said the sizzling tanigue is one of Rico’s Lechon’s bestsellers. 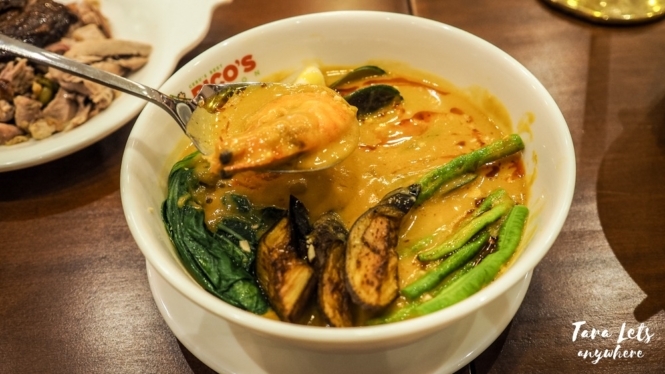 Lastly, their seafood kare-kare tasted good as well, with thick tasty peanut sauce and lots of vegetables, although I find the seafood too few. Perhaps I’d enjoy the beef tripe kare-kare better because I prefer my kare-kare with a balanced mix of veggies and meat. That’s all the main dishes that we ordered and could eat. Lechon (regular, 1/4kg – P250 / spicy – P290). For the desserts, the pandan tapioca is light and creamy, a bit sweeter than I’m used to. Still, I’d probably order this again because I’m a sucker for pandan desserts. The leche flan is firm and perfect. This is the first time I get to taste kamote balls and it’s okay too, though I’d rather order it as an appetizer because it has a strong flavor that needs to be washed down. Pandan tapioca (P100), kamote balls (P95), leche flan. As for the drinks, they have various options including sodas, iced teas and fruit shakes. 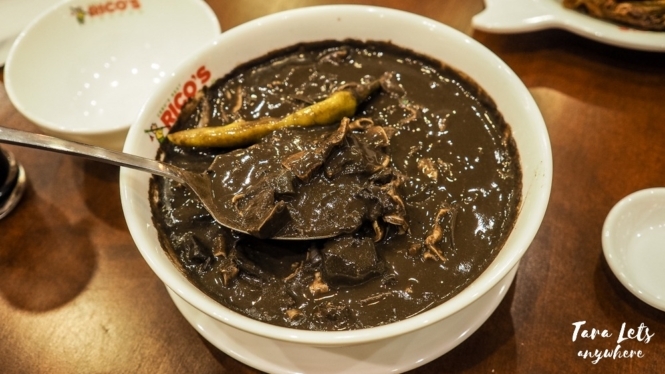 Overall, Rico’s Lechon serves good-quality Filipino food. 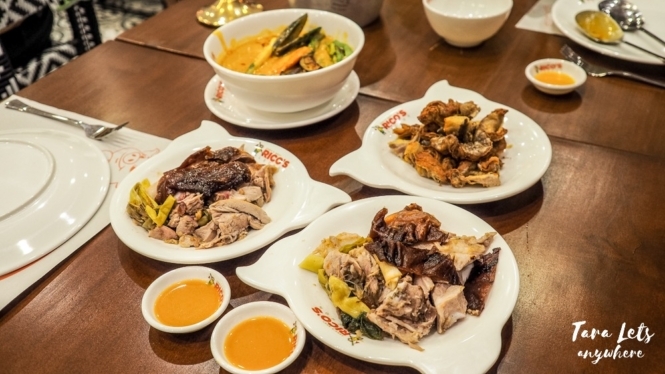 For the main courses, the lechon is truly the highlight of their menu. If you want a more flavorful lechon than the ones we’re used to here in Manila, try out the regular or spicy version of this restaurant. 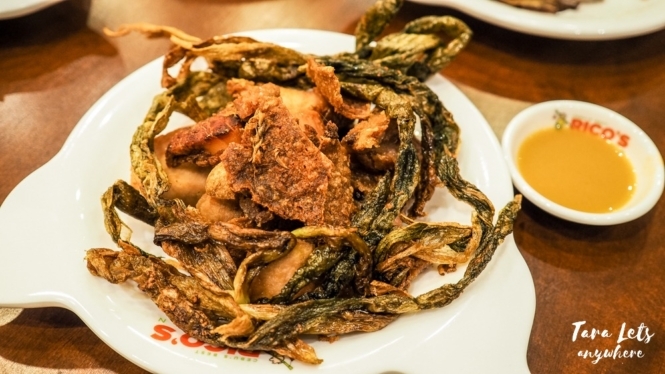 Rico’s Lechon is ideal for those who love lechon and other Filipino cuisine. It’s a mid-budget local restaurant, with main dishes priced at P200-300+ and usually good for sharing between 2-3 people. The setting is fitting for families or groups. 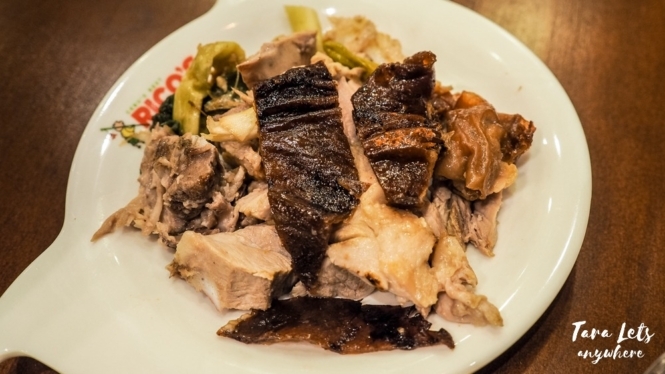 If you want a nice meal or are celebrating in a group, Rico’s Lechon is a great option. Disclaimer: Thanks Rico’s Lechon for inviting me! As always, all thoughts and opinions are mine.